This Wednesday I wanted to blog about Astragalus utahensis. 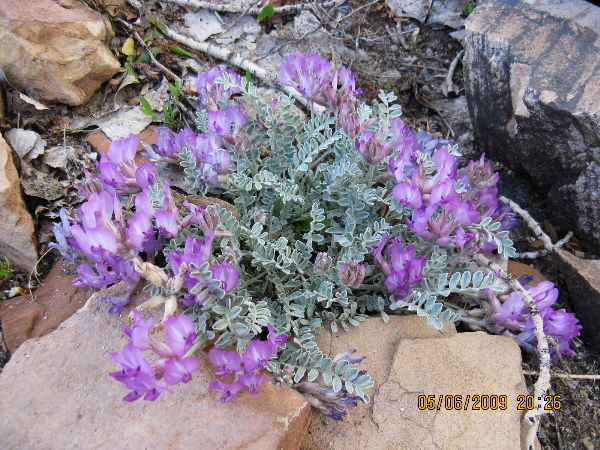 It is one of many Astragalus species native to Utah. My first introduction to this plant was on the foothills of the Wasatch range. In spring their purple/magenta flowers jump out against their silver foliage. They are some of the first wildflowers to bloom in our region. 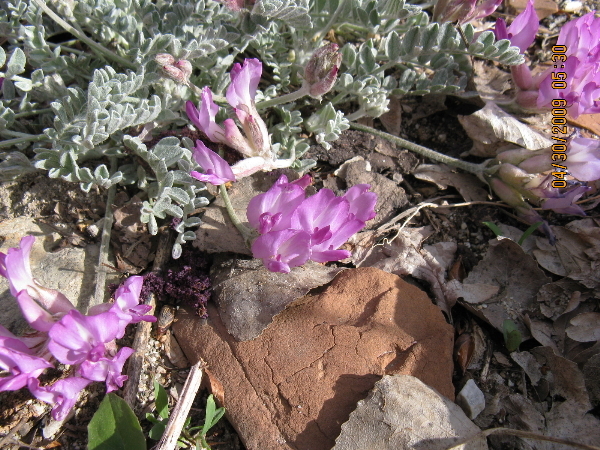 Astragalus utahensis grows in rocky/sandy earth with little water. In these harsh conditions they will flourish. Here is a general information page on Weeds and Wildflowers. Astragalus utahensis goes by several common names. Locoweed is one of them. 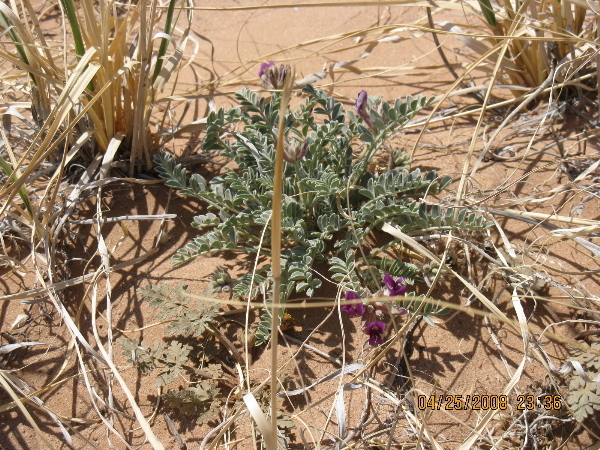 Some Astragalus species are poisonous to cattle and can cause major problems for ranchers. For more info see this publication from NMSU. I’m not sure if this one is actually poisonous but people around here call it Locoweed. Utah Ladyfinger is an alternative name used by folks at INPGA and Slow the Flow. They are promoting it as a lovely low water ground cover or desert rock garden addition for our landscapes. And rightly so. But you can’t sell it with weed in the name. A few years back I was lucky enough to pick up some Locoweed seed on my shoes (I think) and then had a Utah Ladyfinger pop up in the old sand box out back. I have not been lucky enough to have it reseed (not much of a weed I guess). I haven’t seen any signs of it this spring, but we had a few good years. Here is a close up of this beauty. Despite this being a Utah’s Choice plant, I have not seen it for sale at the local nurseries. Maybe I just haven’t noticed but I don’t think so. 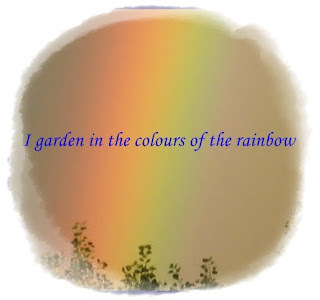 I am planning on building a small rock garden and would like this as a permanent part of it. I was so excited to find it for sale from Rugged Country Plants. But alas, they are temporarily sold out. I will keep checking though. Thanks to Gail over at Clay and Limestone for hosting Wildflower Wednesday. PS. Seed can be obtained from Western Native Seed, Alplains.com, and Wildflowers Unlimited. Many of Utah’s good nurseries carry packets of Wildflowers Unlimited’s native seeds, usually by the checkout counter. If you can’t find them at your favorite nursery it looks like Wildflowers Unlimited takes orders through the mail. I should be so lucky to track in a gorgeous wildflower to my garden. I guess I need to go hiking more…. Hope your “weedy” friend comes back for you this year. If I’m lucky enough to have it come back this year, I’m collecting the seed. It’s not a demanding plant, the only water mine gets is from the sky. Love your blog by the way, it’s so informative. Ooh, I just googled that one. It’s pretty too. Love the post and the plant. I think the one I killed was from the Red Butte Garden plant sale, so maybe they’ll have some this year. I’d like to plant it again with better placement this time. I hope they have it too. It is very pretty. I love the purple with the contrast of the silver/gray foliage. Lovely. I hope it spreads for you a bit. The common name is quite a name. It is quite a name. For the longest time I couldn’t remember if it was Astragalus or Astralagus. I think I’ve got it straight now. That’s a beautiful little plant. I hope you can find a steady source for it (rather than tracking it in on your shoes!). I’ve heard of the issues with locoweed and didn’t realize they were recommending it for dry gardens. I have heard of Locoweed before but didn’t realize it was such a beautiful wildflower, both in foliage and flower. It’s really lovely.